Following the huge success of last year’s Irish Curry Awards, the hottest and most exciting food competition on the island, is set to return this October. Taking place on Tuesday 24th October, the Irish Curry Awards will gather with a panel of expert judges to find the best of the curry houses across the island. Belfast-based restaurateur Ali Askir introduced the award-scheme last year, after recognising the significant role of curry houses in strengthening local economies and communities. With an estimated 700 curry houses in the Republic of Ireland and Northern Ireland, there are thousands employed in this sector. Speaking on the awards, Ali says: “Last year’s event was a fantastic success and we were overwhelmed by the level of entries received from across Ireland. 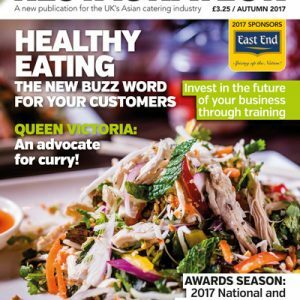 Two additional categories have been added this year – Best South Asian Curry and Best Customer Service (South Asian Curryhouse). A quota of votes will be calculated at the close of entries to create a shortlist of restaurants county by county. A panel of expert judges including food writers and editors from broadcast and leading newspapers will attend all shortlisted premises and meet to discuss their findings before selecting the winners.